Work during August and September focused on building the Australian Rail Track Corporation (ARTC) yard located beside the stone cottage near the per-way siding at Wallerawang. This yard is accessed off Pipers Flat Rd and backs on to the Mudgee branch line as it swings away from the main line. 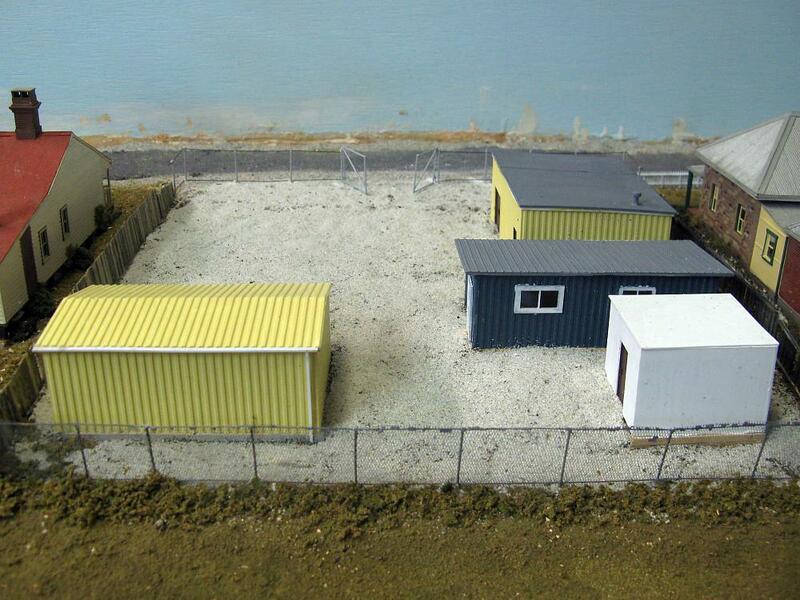 The yard has a collection of simple buildings and is used by the ARTC as a works depot. Previously the yard had been scenicked with basic 'burnt grass' groundcover to make it presentable at exhibitions. First step was to remove the green scenery from the yard and temporarily remove the surrounding fences to allow for construction work in the yard to proceed. 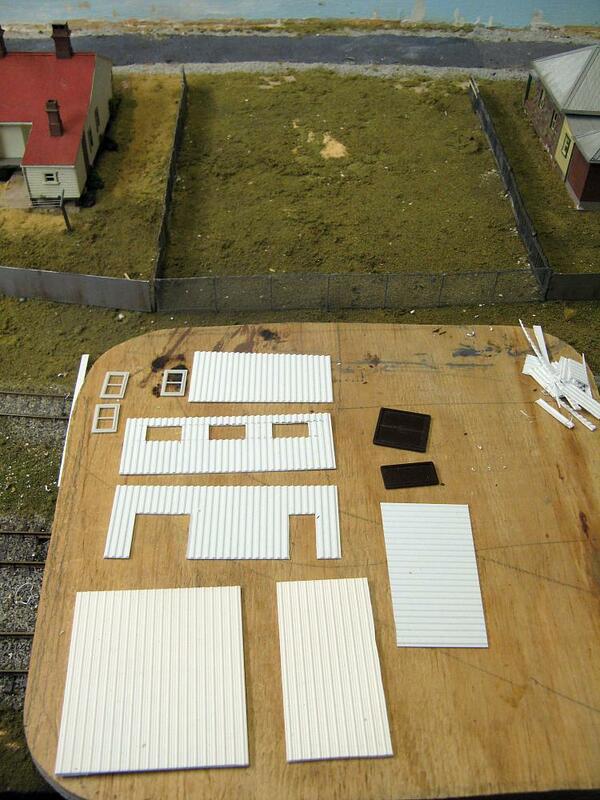 Next, certain sections of the yard were levelled to allow for placement of each of the individual buildings. Before: The yard with basic groundcover - ribbed styrene walls and roof are cut out on the board, along with windows and doors from the spare parts box, ready to assemble into one of the structures on the site. The buildings were made from styrene sheet in a variety of styles including ribbed, corrugated and flat, to represent the buildings actually on site. Building construction including dimensions, materials and colours were based on site photographs. Suitable windows and doors from the spares box were glued into holes cut into the walls. Roof gutters were made from 1.5mm styrene C-channel, and downpipes from rectangular styrene strip. Strips of balsa were added under the buildings to assist with levelling them, and when painted represent the visible edges of concrete slabs, or in the case of the white building, left unpainted to represent the real timber slabs used under the prototype building. During: Fences and groundcover have been removed and parts of the site leveled for the 4 individual buildings, shown here being placed for checking before final fixing. 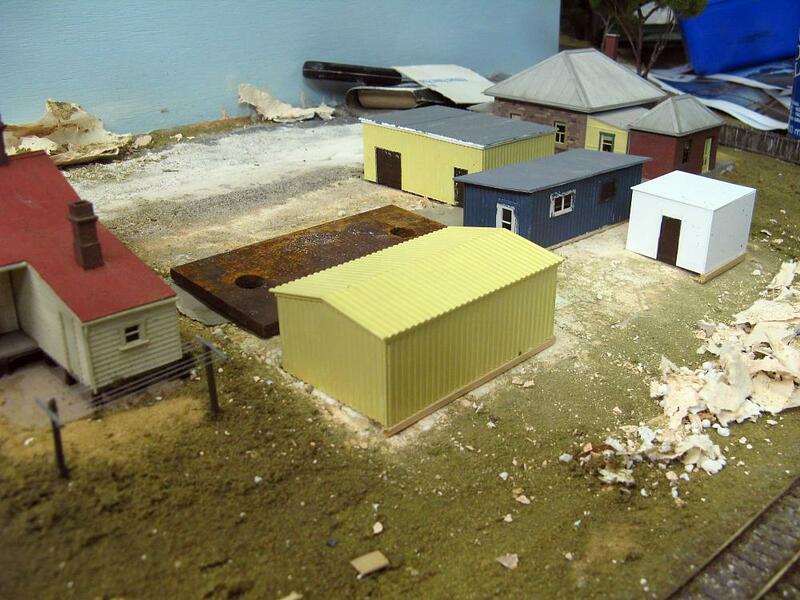 After the buildings were glued in place the gravel surface of the yard was made by gluing down a layer of fine white ballast from the Chucks ballast range. The side (timber paling) and rear (wire mesh) fences were reinstated and some basic detailing around the area done with the addition of weeds, grass clumps and debris. After: The four completed buildings glued in place on the graveled site. The front fence is still to be completed along with additional detailing. 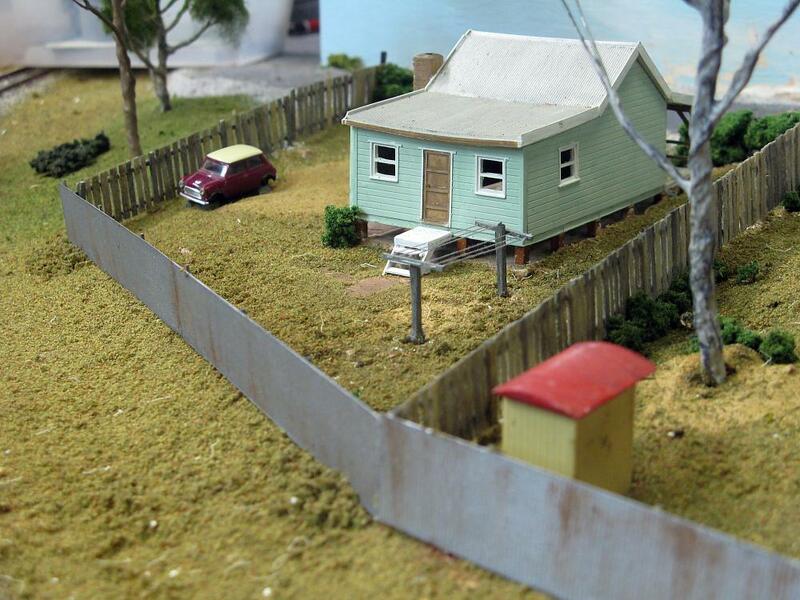 A wheel-less Mini Cooper from the spares box was glued onto timber blocks and fixed in the yard of the blue house. The red roofed backyard dunny also from the spares box sits in the back corner next door.